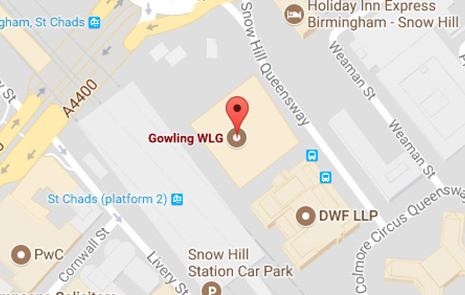 Birmingham is the UK's second city and home to some of Gowling WLG's leading UK lawyers. Our long history in the region means we are well placed to assist you in making the most of a thriving and evolving local economy. Our Birmingham office has a nationwide reputation in areas such as real estate. Insight is always backed up by people with a resolute focus on commercial results. A base in the City and close connection with our international offices means you can also get the first class advice you need on UK matters of any nature, delivered in a flexible and cost-effective manner. Making a real connection with our people and clients, we use commercial and innovative thinking in Birmingham to provide the legal solutions our clients need to prosper, wherever they are in the world. There is a regular train service between the airport and New Street station. The journey time is approx 20 minutes. Follow the directions above to walk to Two Snowhill. Taxis are also available from outside the airport. Birmingham New Street station is a ten-minute walk from our offices. Pass through the ticket barriers on the new concourse, following signs for the 'New Street Exit'. On leaving the station, walk straight ahead up Corporation Street. Turn left on to Upper Bull Street. Walk around Colmore Circus Queensway and then continue down Snow Hill Queensway. Our Offices are located on the left hand side of the road. Alternatively, taxis can be found outside the 'New Street Exit' of the station on Stephenson Street. Birmingham Snow Hill train station is located next to our offices. If travelling from the south into Birmingham city centre, please follow A38 though all Birmingham tunnels. After exiting the last tunnel, take the 1st exit signed A34. Please travel around the island taking the 5th exit back onto the A38. Please then refer to northbound directions as shown. Arriving by car travelling from north or south on the M6, Exit Junction 6 to the "A38M" sign posted "City Centre". Continue straight ahead for two miles. At the "End of Motorway" sign, continue straight ahead onto the flyover, curving around to the right. At the end of the flyover, exit left, before the underpass (Royal Angus Hotel). Continue ahead to a set of pedestrian lights, followed almost immediately by traffic lights. Straight ahead over these lights towards a railway bridge. Immediately before the bridge turn left into a private access road. You are now under the building. Continue along this road to the second barrier on the left-hand side. At the barrier, press for Landlord Security and announce yourself. You will then be let through to the car park. Please ensure you park in a designated parking bay. At junction 3A, take "M42 North" exit to junction 7A "M6 North" and follow M6 directions above. Exit junction 8 to "M6 North", and follow M6 directions above. Continue onto the "M6 South" at junction 1, follow signs for "M6 South", exit J6 and follow M6 directions above. Limited car parking is available in our building but you'll need to book a space; please call our Birmingham reception (+44 (0)370 903 1000). Alternatively there are a number of public car parks nearby. The nearest one to our office is at Snow Hill station. Snow Hill Car Park - From Colmore Row turn right into Newhall Street, right into Edmund Street and then second right into Livery Street. Snow Hill car park is immediately on your left. From St Chad's Queensway/Great Charles Street turn left directly into Livery Street and the entrance to the Snow Hill car park is towards the top of the road on your left.